It’s Friday evening and I am sitting here feeling all depressed after finishing the book in the picture. I’ve been reading pointless Commissario Montalbano detective stories for weeks now with nasty language and with a nasty leading man in them, so I was ready for something else. Something worthwhile, something that I might be able to use for that paper I owe myself and the University to get my degree. So it was with great disappointment that I had to rate this book with just three stars on Shelfari. Others have rated it with five stars but I don’t know why really. To not insult the poor woman’s memory? Or the daughter that thought her mother was great? Frankly, I think that the worse biographer is the one that is related to the subject! Too close to do a good job! I wish I had paid attention to this before I sent for this overpriced book. My first complaint about the book started when I got it out of the box that the book depository sent it in. What a ridiculous size for a book! Almost square and big so you can’t bring it with you in your handbag for those trips you have to take, fetching children and waiting for them! And who was the font size for? Sight impaired people? Or children just learning to read? The font size is big, the entire page is never utilized but there are lots of white space not to speak of all the entirely white pages! I sat wondering if there was a printing error, if my book was missing text? If the font had been kept normal, the pages been normal, the book had contained half the pages it now has (210) and had been much cheaper. Maybe the publishers wanted the book to look like letters and so forth, but it did not achieve that at all. I just felt cheated on my money! Short changed and since LeOna fired people in Rome, for doing just that to all the boys that came in to the red cross club, I am sure she would have hated the format and layout of “her” book! Now to the contents itself. This is where I really got depressed. It says that LeOna wrote 200 letters. Where are those letters? Here her daughter has made a selection of them and only very few are published. Well, I strongly disagree with her selection. Had they published the letters in a regular format of a book, and had put all the 200 letters in it plus all the necessary background information, it would have given a good picture of who this LeOna was. Now it does not do that at all. It starts out fine. 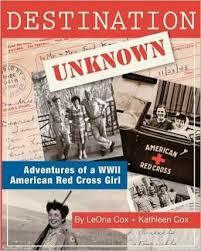 LeOna is handpicked by the Red Cross recruiter, trained in how to entertain the boys with card games, square dances etc. She is having a blast, coming from Minnesota and suddenly be the centre of attention at age 27, when most girls were married. That was the job she signed up for. Entertaining the boys and as far as I recall from previous studies, they were not allowed to date a particular boy, not flirt and show preference. She sails for North Africa as late as December 1943. Her letters are fun, informative. And THEN three months later she is already in such a serious relationship with a man that they are talking about their wedding. All letters are now covered with details about their excursions, their love, her begging her parents to accept him, telling them they will wait and marry till after the war but soon the wedding date is set for September 1, and then they are on their honeymoon and they were not going to start a family till they had a home of their own, but this G.I. didn’t understand Patton when he told the boys to use condoms. She is pregnant two months after the wedding and goes home on a hospital ship in March 1945. And there is no mention at all about them not having planned this pregnancy. They could have made sure she served her time as she was supposed to do. I really did not buy this book to read about yet another girl who wasted people’s time! She signed up to do her duty for the duration and like many other girls she just bailed out after a short time. She wasted the training that she received. She let people down. Someone else had to come in and take her place. Someone new had to be trained in her place. And for her daughter to call this a book of the American Red Cross, well it’s not. As soon as she meets her love, that is basically all that is going on in the letters home since her parents did not want a Catholic son-in-law. The daughter should have stuck with the letters that told her war service experiences. Love novels can be found anywhere! It held no interest to me what so ever to read about their wedding plans, their dinners and so on. It just showed a person that I do not think the daughter really wanted to show or? A person that was more interested in having fun herself than caring about others. I am sure she did the latter, like one sees in her earlier letters, but her daughter did not let us get to see that after the first three months in service overseas!!!! I am sure that had we been allowed to see all the 200 letters it would have given a more well-rounded view of things. Now I can just guess and I don’t like it at all. So a wasted afternoon/evening! The book has just made me mad!